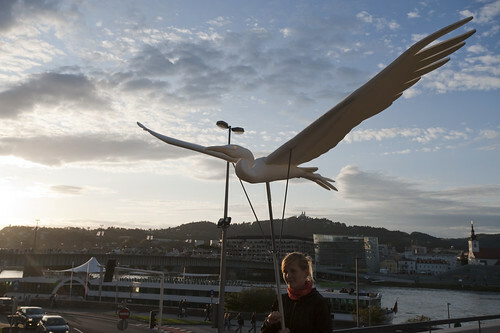 Bird Puppet, in Linz, Austria. It’s so far away I can barely see to it, but at SXSW 2010, in March a bunch of us will be doing a panel called Design Fiction:Props, Prototypes, Predicaments Communicating New Ideas. I managed to wrench the longer description I had written into the SXSW panel proposal form with some edits, but I’ll give you the original here, along with the original title, which wouldn’t fit.. This panel will present and discuss the idea of “design fiction”, a kind of design genre that expresses itself as a kind of science-fiction authoring practice. Design fiction crafts material visions of different kinds of possible worlds. Design’s various ways of articulating ideas in material can be seen as a kind of practice close to writing fiction, creating social objects (like story props) and experiences (like predicaments or scenarios). In this way, design fiction may be a practice for thinking about and constructing and shaping possible near future contexts in which design-led experiences are created that are different from the canonical better-faster-cheaper visions owned by corporate futures. This panel will share design fiction projects and discuss the implications for design, strategy and technology innovation. In particular, how can design fiction bolster bolster the communication of new design concepts by emphasizing rich, people-focused storytelling rather than functionality? How can design fiction become part of a process for exploring speculative near futures in the interests of design innovation? What part can be played in imagining alternative histories to explore what “today” may have become as a way to underscore that there are no inevitabilities — and that the future is made from will and imagination, not determined by an “up-and-to-the-right” graph of better-faster-cheaper technologies. This alone may draw me to SXSW.